I love this poem for its beautiful iambic rhythms. I love it for the way it darkens, and for the beauty that the poet enkindles from that darkening. I love, even, the turn at the end to the poem's summation. 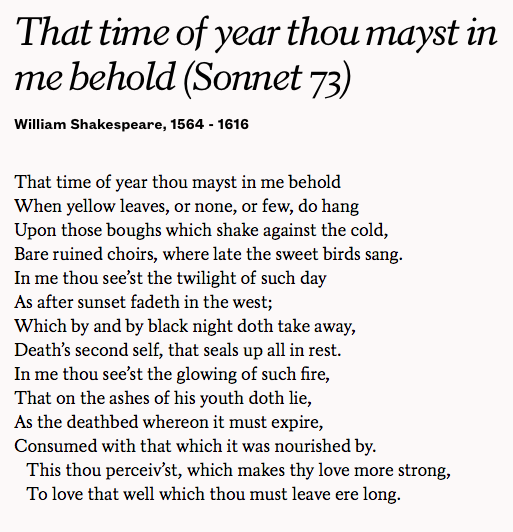 The poem earns its summation, because of the beautiful way it has given embodiment to it in the previous twelve lines. Today, two students presented about the sonnet. One of them read some of the most beautiful sonnets ever written as if they were poncey frilly things. There's something about this language and its decorum--its sharp keeping of a code--that can seem very old fashioned, I suppose, to very young people. Anyway, you don't get anywhere by holding that against them. You just have to demonstrate how to give yourself to that music, that very solemn and steady music, because sometimes, slow, deliberate, vivid and heartbreaking song is what's called for. It's the only thing whatsoever that will do. And no, you can't hold it against them. Frilly might lead to full love some day. Nik quoted my favorite sonnet of all time. I read this to John at our wedding. No frills there, just the embodiment of pure, true love. I must needs go read some poetry now.